Capri is an Island off the coast of Sorrento and south-west of Naples. It is the playground of the rich and famous. To get to Capri you must take a ferry. There are two types: 1) the fast hydrofoils and 2) the slow boats. The hydrofoils cost more but cut the time almost in half. All boats arrive at Capri at the Marina Grande (Big Marina). If you are spending the night, there are porters here that take your bags to your hotel for a small fee. At first we were concerned about people grabbing our bags but it is normal here and all the hotels use them. From the ferry you can take a bus up a winding road or a funicular up the mountain. Take the funicular. It is in a store front directly opposite the ferry docks. At the top you are in Capri City (on Capri Island) in the main square (Piazza Umberto). This is a huge Piazza with views, clock tower and restaurants. One of the roads (directly opposite the funicular exit) is Via Roma. Take this a short distance and on your right is a bus station. 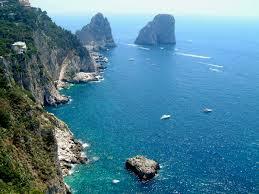 From here you can go to Capri’s other city, Anacapri. This trip has magnificent views of Marina Grande. You will find great ceramics here. We also rented a boat to tour around the Island (not just the Blue Grotto). It cost us about $160. There are two restaurants near Fragolini Rock. They are down hundreds of steps but worth the view and the food. They are 1) Fontelina Beach Club and 2) Da Luigi ai Fragolini. You can also take a boat here from the small Marina (piccola Marina). The boat trip around the Island and through Fragolini Rock is well worth the trip. You see small caves with beautiful blue waters, you can go into the famous Blue Grotto but it is usually very crowded. You go past both marinas and on the east side of the island you can see Vesuvius volcano in the distance and the start of the Amalfi Coast. Capri is a romantic place with friendly people, great shops (some very expensive), great food and wine and the best views around. Yesterday we BLOGed about Potenza Italy. Bari is about a 2 hour drive east of Potenza on the RA5 and then SS407. Bari is on the Adriatic Sea with a protected boat marina. It is a city of above 300,000 people. It has an old town and two modern harbors. There is a beautiful old Basilica and a castle to see. The Barivecchia is an old area of the city. It is a sprawl of narrow streets and paths. Until recently it was considered dangerous for tourists because of petty crimes. Today it has been improved and it is an area of pubs and restaurants. Many artists are in this area. Just north of Bari are the towns of Bisceglie, Barletta, Polignano a Mare and Trani, which have some of the best beaches in the area. Watch your valuables as Bari is known for pick pockets. If you are used to walking in any big city, this is not a major problem. 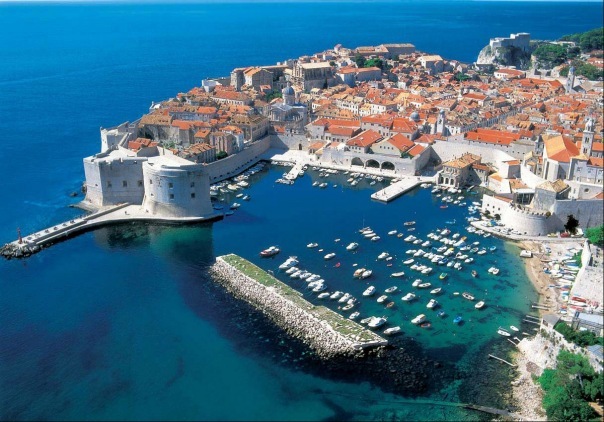 Ferries from Bari go to many places including Dubrovnik and Greece. Airplane – The fastest but expensive. Drive – This allows you to experience the beautiful countryside. At Messina, Italy you drive onto a ferry which takes you the short distance to Sicily. Train – The train allows you to enjoy the countryside without driving. The train ends up in Messina where it is loaded onto the same ferry as #2 above. At the ferry docks in Sicily and train is removed and continues it journey in Sicily. Sicily is an Island that almost touches Italy at Messina. It is also very close to the African coastline. Many Italian-Americans are from Sicily so this is a popular destination with American tourists. You can fly into Rome or Naples and train it to Sicily. You might want to stop along the way at the many beautiful villages you will pass through. Spend some time maybe a night and reboard the train to Sicily. The BLOG “The Train to Sicily: Ferry From Messina to Sicily” has excellent suggestions and pictures. Enjoy! Casal Velino Marina – This is the closet beach to us (we can see it from our deck). It is white soft sand with palm trees and lots of restaurants. Some restaurants and bars are right on the beach. You can, of course, get pizza and gelato here. The town is not huge so you can walk to anything. Parking in the summer months costs but is free off-season. There are small hotels, B&B’s and Agrotisimo’o nearby. You can find ferries here to get you to other cities, boats for hire and a huge marina. Ascea – This is another beach just south of Casal Velino Marina.There are less tourists here and the beaches are just as nice. 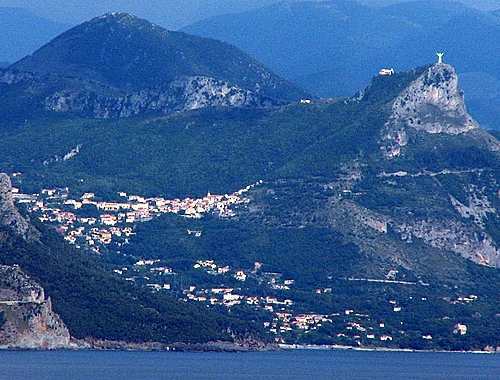 Maratea – This city is in the mountains and on the coast. It has a beautiful cross high up in the mountain.